Lazy weekends are the best. Those perfect mornings when the only thing on your agenda is a hot cup of tea and lounging around reading a good book. And sometimes those mornings call for something a little extra, a little different. Begone healthy cereal! Begone healthy granola! Begone oatmeal! Begone begone begone! This is no time for quick and nutritious. This is the time for something just a tad bit special. Something with a hint of spice. Something with a dollop of comfort. Something that doesn't require changing out of pajamas any time soon. As children, "pancakes" for us meant my mom making us thin crepes, crinkly and crisp around the edges, cooked just so, and drizzled with honey. Imagine my surprise when, upon arriving in the US, I was faced with enormous fluffy cakes (literally!) made in a pan! My mouth puckered up as I hesitantly bit into a maple syrup covered bite. What was this medicinal stuff? Where was the smooth sweetness of honey? Horror of horrors - the Americans had ruined pancakes!! Blast! But now, years later, I shake my head at my younger self. "Self," I say, "you were silly!" and liberally pour golden brown syrup over these crisp fluffy little cakes that are quintessentially breakfast. As always, a little spice makes everything just that much more nice. I can't help it. Even in the simplest recipes I find my hands getting a life of their own and reaching toward my spice cabinet. It's a problem. I admit it. Now let's move on. Just a note: these were made quite lazily, which resulted in an unplanned-for taste test. 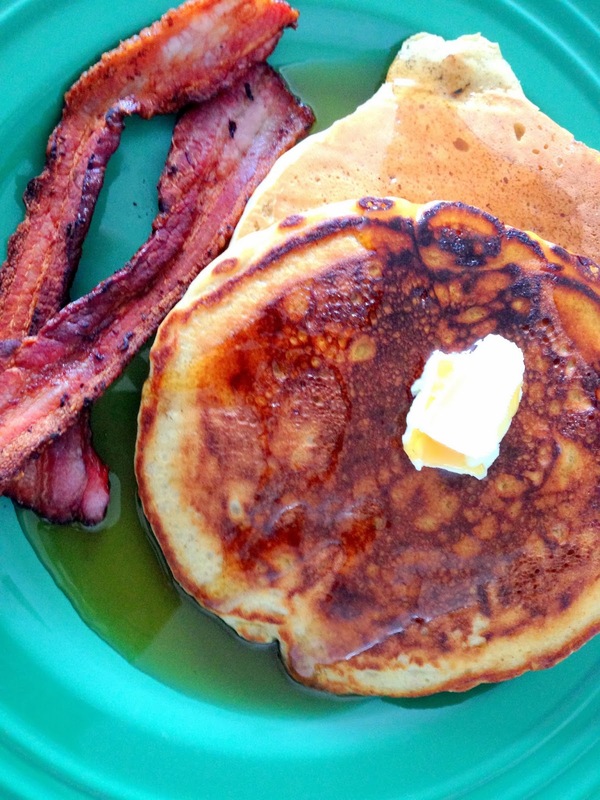 Take my advice, and don't leave the melted butter out if you want nice airy pancakes. If you do, your pancakes will become dense and a lot less fun. 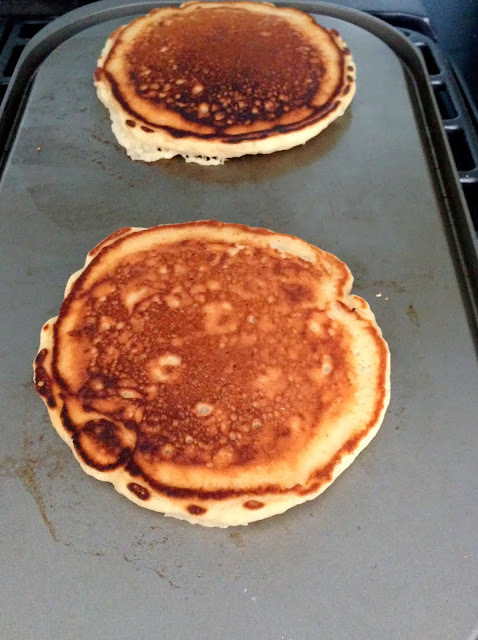 Thankfully I realized this grave error after the first two pancakes, and quickly remedied the matter. The taste test proved that the butter was absolutely essential. Don't worry, you can go back to eating oatmeal tomorrow. Beat the eggs in a small bowl. In a separate bowl, combine the yogurt and milk. 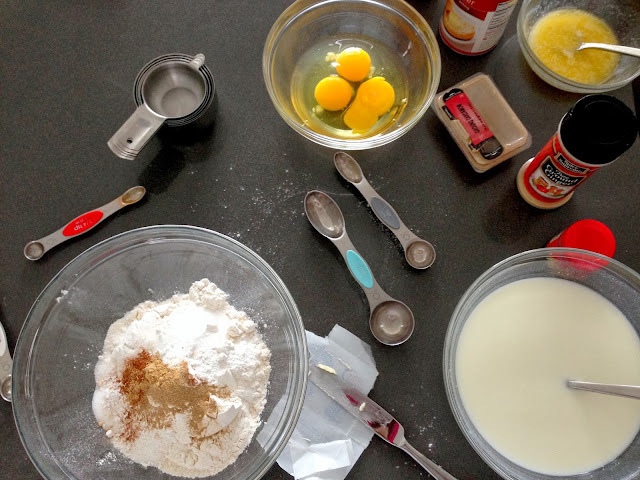 In a large bowl whisk together flour, baking powder, baking soda, sugar, and spices. Mix in the beaten eggs, melted cooled butter, and yogurt-milk mixture - don't mix too much, because you still want small to medium lumps (you can mix the wet ingredients together first and then add them all into the dry ingredients together to reduce your mixing). 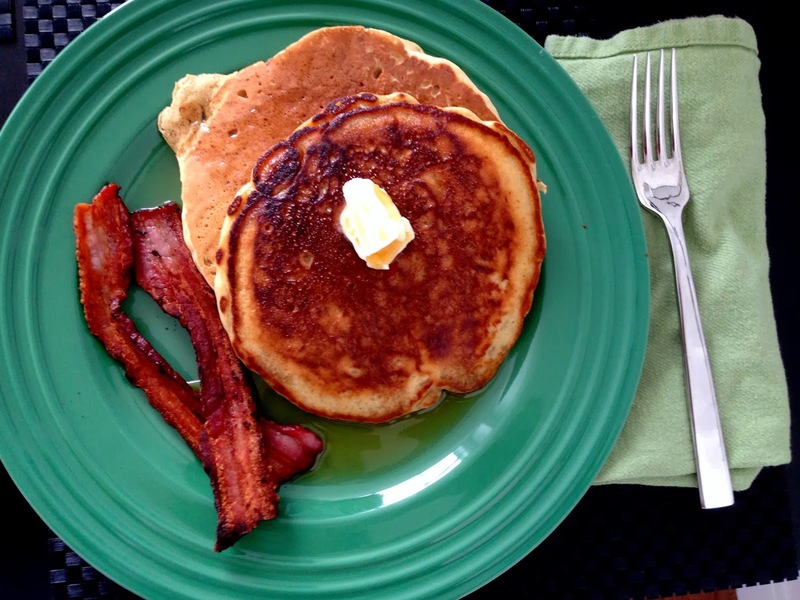 Preheat a cast iron griddle/cast iron skillet on medium low heat. 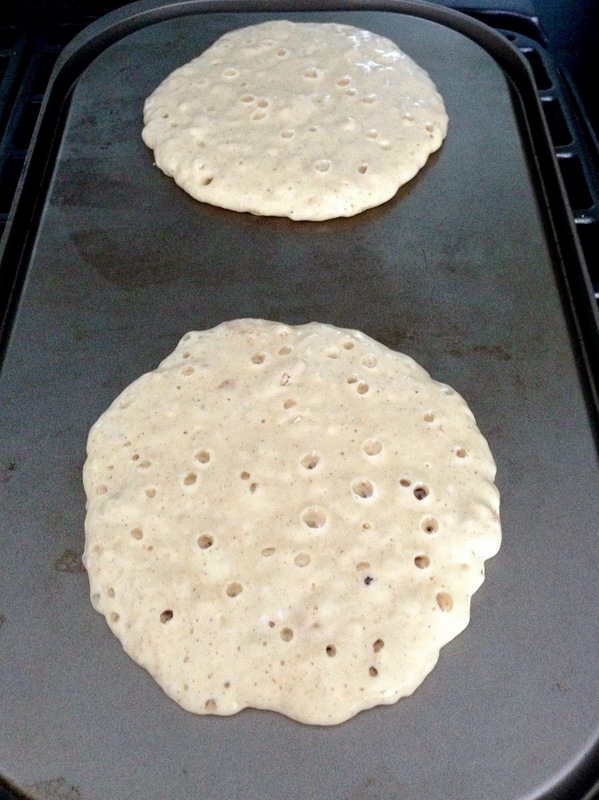 Sprinkle a couple of drops of water on the griddle to test if it is heated (water should spatter). Grease the griddle with a little butter. 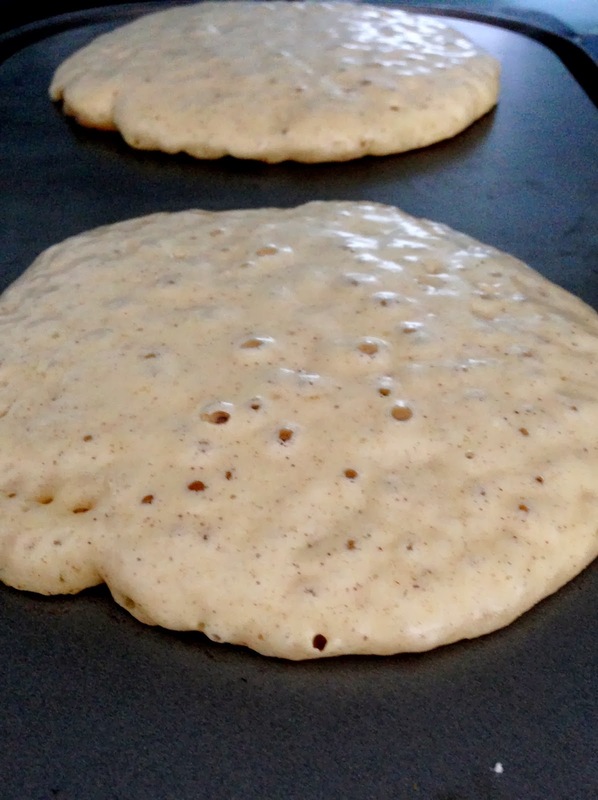 Pour 1/2 cup of batter on the griddle. After 2-3 minutes (when the pancakes have a lot of little bubbles on top), flip and cook for another minute or so. Remove from heat and serve with butter and maple syrup. If you're a meat eater, don't forget the bacon. Everything is better with bacon!